Summary from Goodreads: Sixteen-year-old Tatum Elsea is bracing for the worst summer of her life. After being falsely accused of a crime, she’s stuck under stepmother-imposed house arrest and her BFF’s gone ghost. Tatum fills her newfound free time with community service by day and working at her covert graphic design business at night (which includes trading emails with a cute cello-playing client). When Tatum discovers she’s not the only one in the house keeping secrets, she finds she has the chance to make amends with her family and friends. Equipped with a new perspective, and assisted by her feisty step-abuela-slash-fairy-godmother, Tatum is ready to start fresh and maybe even get her happy ending along the way. 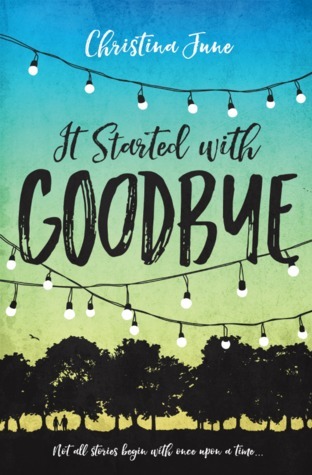 It Started with Goodbye was a sweet, summer romance full of friendships, art, and of course, romance. I really enjoyed this book. I loved the romance and the friendships. The story wasn’t my favorite and it was a bit cliché at times, but I still enjoyed it. Also, I had no clue that this was a Cinderella retelling until after I read it. Looking back on it though, I don’t know how I missed all the similarities. Tatum has a stepmother and a stepsister (only one, not two) and the romance is all based around Tatum losing something. Well, sort of. And her step grandmother is basically her fairy godmother too. This book starts out with Tatum Elsea being falsely accused of a crime. Her best friend’s boyfriend had stolen from a store and Tatum had just happened to be with them, but knew nothing of what was going to happen. Because of this, her dad and stepmom essentially put her under house arrest while her dad is on a trip for the summer. In the meantime, she starts an online graphic design business, where she meets SK. Well, they don’t exactly meet. They do start to become friends though just over emails as he asks her to design him an online portfolio. I quite liked the main character. She wasn’t my favorite, but I still liked her. I thought it was really interesting reading about someone who does graphic design. That’s something I’ve always found really interesting that’s just not for me. I don’t think I’ve read any books featuring characters interested in graphic design, so like I said, I enjoyed that small aspect. I also really liked all the side characters, especially Tilly and “SK”. I really liked Abby and hudson as well. Of course I can’t forget Tatum’s “fairy godmother” step-grandmother Blanche! I thought blanche was really sweet and amazing. She was so supportive of Tatum and helped her to start her little graphic design business. She was definitely one of my favorite characters. My favorite thing about this book though was the strong relationships, and not just romantic. Tatum’s best friend abandons her after what happens, but Tatum is still trying to fix their friendship. Normally you read about friendships that get broken up and then they don’t do anything to try and fix them. Tatum also starts to become a lot closer with her family, which I loved. One of my favorite things in books is strong sibling relationships. Throughout this book, Tatum’s relationship with her step sister grows. Originally they just kind of ignored each other, so I was really happy that they became friends. But the romance was also really sweet. Tatum and “SK” got to know each other through emails which was really adorable. One of my favorite scenes in the whole book was when they actually met. It was just so cute! I feel like it was kind of insta-lovey, but not really? I’m not entirely sure because it didn’t feel like it, but it still was. Like I said, the romance could be a little cliché at times I thought, but it was still really sweet. The writing didn’t really stand out, but then again I feel that way about most contemporaries. It was told through Tatum’s POV. I thought the author did a good job at portraying emotions and giving just enough detail to create a clear picture but still enough for you to fill in the blanks. Overall, I thought It Started with Goodbye was a super adorable, cute summer contemporary. It kind of reminded me of Morgan Matson’s summer contemporaries in a sense, but it was totally different. So yes, if you are a fan of Morgan Matson, I definitely recommend this one. The romance was adorable but not the main focus (which I loved). The main focus was more so the friendships and family relationships and I loved every bit of it. It could be kind of boring and cliché at times, but that doesn’t mean I didn’t enjoy it. I’m excited to read more from June!